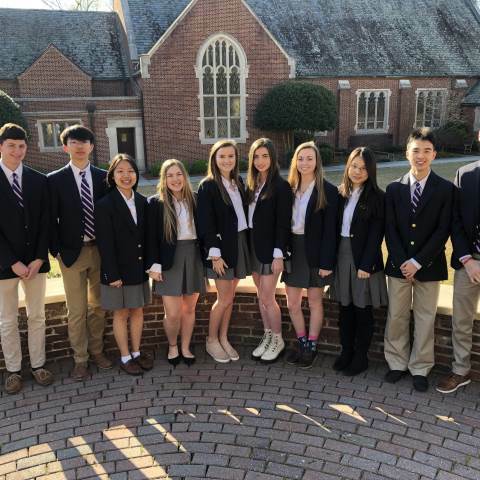 A cohort of rising seniors has been selected for next year’s inaugural Senior Ventures leadership program. This cohort represents 11 projects spearheaded by 12 students that have been chosen with a variety of topics ranging from farming to technology development and financial literacy to musical composition. Lucy will serve as the lead student manager of the DarFarm. She will recruit, train, manage the budget, and oversee projects such as maintaining the greenhouse, raised beds, and chicken coop. She will also serve as the the community outreach and servant leader. This involves collaborating with the lower grades at Darlington for educational experiences for younger students to get involved with sustainable agriculture. Lauren will establish a program dedicated to helping military teen youths, ages eleven through fifteen, cope with issues they may face while their parent(s) are actively serving in the military. The program can be adapted to any group of latch-key pre-teens in a community that face similar challenges of loneliness and neglect because of circumstances outside their control. Through the Senior Venture Project, she hopes to help these children, whether their parents serve our country across the globe with unwavering devotion, or are busy working to support their families. David and Sharon will use the most recent artificial intelligence to train a model that automatically detects a crime scene and reports it to the police. Their goal is to design a system that puts connected devices into use and automatically detects and reports the crime scene to law enforcement departments. The system is able to read frames from an input camera source (or just simply an input source) and will have the capability to determine if the frame involves a potential law-breaking action. Carlie will explore the bounds of profiling, either used for investigative purposes, or used as a mechanism to stereotype, through social psychology. She will develop a way to teach the Darlington and Rome community what she has learned about stereotypes. Bella will be writing, recording, and producing an album. Completing this album will help bring an abundance of fresh art to the school while creating music that taps into the emotions of those listening to it. Trang will write a fictional novel examining math topics and concepts. The story will take shape as a hero journey, incorporating all of Joseph Campbell’s 17 stages, such as the departure, the initiation, and the return. In the book, the protagonist will encounter various difficult dilemmas and challenges where he or she will apply mathematical thinking to overcome them. Through this project, she aspires to explain core theorems and equations in Algebra, Geometry, Statistics, and Calculus. Alexander will be developing a Business Manager position for the Jabberwokk (school yearbook). The responsibilities of this job will include creating and designing all advertisements for the yearbook, reaching out to the community and businesses for advertisements, managing the finances of the publication, and marketing Darlington and the Jabberwokk yearbook. Alex will spend his senior year developing an interactive roadmap for the average financially undereducated 18 year old. His website will teach high school graduates how to reach their financial potential explaining Roth IRAs, Compound and Simple interest banking accounts, and trading on the stock market. Veeka will work with companies and the Rome community to accommodate Spanish speakers through better signage and the creation of basic phrase sheets. She also wants to develop a committee that assists Spanish speakers in our community by being translators. Michael will complete research and experiments to discover an alternative to conventional energy sources such as coal or solar energy. He hopes to discover how perpetual motion may be able to charge common hand held electronics or batteries. One of his goals will be to use these perpetual motion machines in everyday non-electrical items such as a watch. He is also interested in using perpetual motion through magnets to create moving art and sculptures. Neal will spend his senior year composing a major orchestral concerto, likely in the form of a single-movement rhapsody or a multi-movement symphony. He will construct the concerto in pieces on paper music sheets and then transport his work it into a more complete digital form using MuseScore. The Senior Ventures leadership program is a year-long senior project built on a framework of leadership, innovation, and community engagement. The topic and the project design is chosen by an individual student or a pair of students, and the journey is guided by Darlington faculty as well as mentors in the community. Most projects will fall into one of the following categories: Investigation, Performance, Entrepreneurship, and Outreach. Candidates are selected according to proposal quality, feasibility, and commitment. Click here to learn more about the Senior Ventures leadership program.